Momma Dee of Love & Hip Hop Atlanta had a major denture malfunction while performing her song "I Deserve" in front of an unsuspecting crowd. Lil' Scrappy's mother was about to perform a 26-minute set during her single release party. Um, wayamin', this geriatric bird with her non-singing azz was on stage for 26 minutes for a SINGLE release party? She couldn't even find the time to record a whole album so she is torturing us with an extended version of "I Deserve"? Jesus be a pair of earplugs! Anywaydoe, the snaggletoof self-proclaimed Queen of the Souf should have used some extra Poligrip that night because her denture completely pop, locked, and dropped right out of her mouth...and it was all caught on tape! So there you have it people. There's no shame in Momma Dee's game. Her flipper will flip flop wherever it pleases, and you will deal with it! 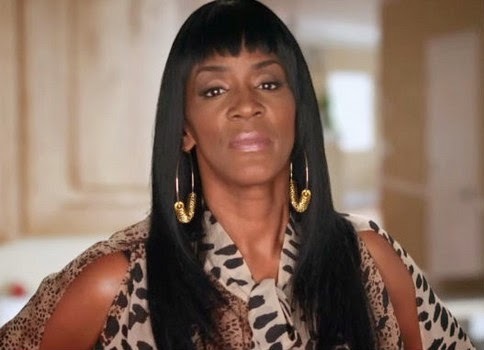 What do you think about Momma Dee's teeth falling out of her mouth during her performance? why she gotta be a crackhead tho? LOL!